Explore the majestic land of Cappadocia, see the fairy-chimneys and mushroom shaped pinnacles. Haggle over the price of Turkish jewelry, carpets, ceramics, and other goods in the famous Grand Bazaar. Wander through Sultanahmet Square, where both the Hagia Sophia and Blue Mosque are located. This section is enriched with so much history and beauty. Hike through the Rose Valley in Cappadocia and see the remnants of underground cities. Experiencing Istanbul and Cappadocia will be a real Turkish Delight! Discover all of the iconic sites of historic Istanbul, including the Blue Mosque, Hagia Sophia, and the Grand Bazaar. Explore the majestic land of Cappadocia, filled with moon-like landscape, fairy chimneys, and underground cities! Begin exploring the ancient city of Istanbul. Visit the extravagant Topkapi Palace, once the main residence of Ottoman Sultans. Wander through the many buildings and admire the beautiful mosaic decorations. See the Hagia Sophia, an ancient seat of the Byzantine Church. Marvel over the Blue Mosque, still a functioning mosque and one of Istanbul biggest attractions. Walk through the Roman Hippodrome that was once used for chariot races. Discover the seemingly never-ending Grand Bazaar. One of the world’s first and largest covered shopping areas, the Grand Bazaar is filled with many small shops offering the best in Turkish goods including jewelry, carpets, and ceramics. Visit a 17th century Spice Bazaar, one of Istanbul’s most colorful, bustling attractions. Take an unforgettable cruise along the Bosphorus, the majestic strait that runs through Istanbul, linking Europe and Asia. From the cruise boat, see the dramatic sights lining the Bosphorus’ wooded shores: mosques, a bridge that for a time was the world’s longest and Rumeli Hisar, a massive fortress built by Mehmet the Conqueror in just three months as he prepared to take Istanbul. Admire the 19th-century mansions of the Ottoman elite and the Sultans’ fanciful gingerbread palaces and hunting lodges. In Cappadocia, take in all of the breathtaking views this region has to offer. Visit the Devrent Valley to see the unique fairy-chimneys. Drive to Pasabagi (Monk’s Valley) to see the most interesting mushroom-shaped pinnacles. Go to the Open Air Museum in Goreme where the remains of rock-cut churches and Christian settlements date back hundreds of years. Hike through the Rose Valley and visit the churches. Explore the old Christian village of Cavusin. Discover the incredible Kaymakli Underground City and see the Ortahisar natural rock castle. Upon arrival into Istanbul, be met by a local Yampu representative who will transfer the traveler to the hotel. At night, be taken to an exclusive night club to enjoy a spectacular oriental show and dinner. The party includes belly dancers, folk groups from various regions of Anatolia and Turkish singers and two soft drinks/half a bottle of wine. Transfer back to the hotel at the end of the evening. 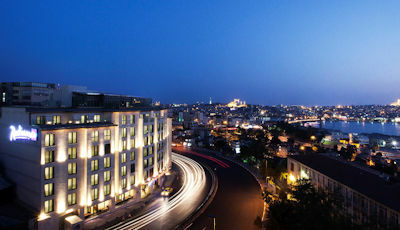 At the appropriate time, be met at the hotel to transfer back to the Istanbul airport for the departing flight. Upon arrival into Cappadocia, be met by a local Yampu representative who will transfer the traveler to the hotel. Depart from the hotel and visit the Devrent Valley to see the unique fairy-chimneys. Drive to Pasabagi (Monk's Valley) to see the most interesting mushroom-shaped pinnacles. In the afternoon visit Open Air Museum in Goreme where the remains of rock-cut churches and Christian settlements date back hundreds of years. Hike through the Rose Valley and visit the churches. Afterwards visit the old Christian village of Cavusin. Stop for lunch near Pigeons Valley and then continue on to see the Kaymakli Underground City. Visit the Ortahisar natural rock castle. Transfer back to the hotel. At the appropriate time, be met at your hotel to transfer back to the Cappadocia airport for departing flight. Visiting Cappadocia is like stepping into another land. The region of Cappadocia is filled with majestic landscape. The land is moon-like and fairy-esque. This spectacular land was formed by the remnants and erosion of lava covered land from the once active volcanic mountains. There are unique rock formations, breathtaking valleys, underground cities, and caves to explore. Welcome to Burcu Kaya hotel in Cappadocia, where history, geography and culture uniquely meet. You will feel at home at Burcu Kaya Hotel. Time at Burcu Kaya hotel transform to fascinated and comfortable adventure between past and today. Burcu Kaya hotel prepared with care twenty years ago for wish host you. We are honor to share our twenty years with reliable, friendly and professional staff with you. We are ready to host your visit as you explore in Cappadocia, which is calm and fascinated. Where History, Tradition and Comfort Meet. The magnificent nature that made cradle to the civilizations and religions since the 5th century. In addition to the three houses carved from the rock in Cappadocia, the mansion was built in the 19th century and restored to its original condition. The visual items that make the Ottoman tradition alive in the decoration of Konagin have been carefully chosen. You will have a pleasant time in Yusuf Yigitoglu Mansion. 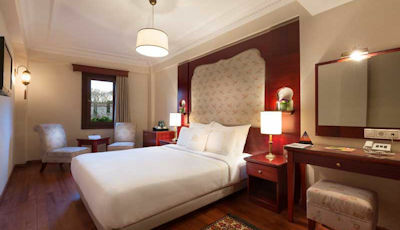 Yusuf Yigitoglu Mansion has 25 rooms, each with 11 standard rooms, 10 deluxe rooms and 4 suites. 24 hours hot water, bathroom, jacuzzi in 10 rooms, satellite television broadcasting, free wireless internet connection (wireless), hair dryer, direct telephone, music broadcast. Cappadocia Cave Suites is located in the city of Goreme, one of the most beautiful and characteristic locales in the Cappadocia region. The famous fairy chimneys and fantastic colorful shapes of the landscape, make this region a natural wonder of the world. Come to relax and explore this historic, wondrous and romantic landscape while enjoying the finest in hotel accommodations and world famous Turkish hospitality. The height of simple good taste. Living spaces designed to heighten the simple pleasures of life: Inviting nooks and crannies, age-old stone enlivened by simple touches, the discerning placement of a few unpretentious objects. Gamirasu Hotel is located near Urgup, the heart of Cappadocia, Ayvali village, with its 35 meticulously restored and designed cave rooms, it is the first rock hotel of the region, put into service in 1999. The hotel, which was used as a monastic retreat in the Byzantine Era, offers a strikingly beautiful nature, serenity and contemporary comfort in a pristine village of unspoiled beauty, without distracting from the spiritual feeling of the area which has been known to be inhabited for more than five thousand years. Some parts of the hotel were used by priests until one thousand years ago. It is the only hotel in the Cappadocia region which contains a Byzantine Orthodox church from the 11th century and in this day, the kitchen which once belonged to the monastery is our kitchen, their dining hall is our dining hall. Some of our rooms are the cells in which priests retreat into seclusion once. Our swimming pool, put into service in 2010, was designed with the inspiration coming from Roman pools in Cappadocia. Since there has been some evidence suggesting that Romans once lived at the place where Gamirasu Hotel is located today, the pool was designed with the antique Roman pool architecture which represents the era. Our pool has 74 m2s space, floor heating, 1.40 meter of depth, special section for children and a very good valley view. You can rest with pleasure while enjoying the view of Byzantine ruins and rest up from the day’s activities. In Cappadocia, one of the most extraordinary geographies of the world, with the mysteries of nature and the mysteries of history, you must first of all choose a special accommodation where you can live this magic world. Kapadakya Lodge brings together history and comfort with its original architecture inspired by natural construction in the region, legendary kitchen with tongues and luxurious accommodation. In Cappadocia’s magical landscape of fairy chimneys, in the ancient village of Urgup, is a unique cave hotel carved into a mountain cliff, the Yunak Evleri. This hotel includes 7 cave houses, 40 rooms dating back to the 5th and 6th centuries and a 19th century Greek Mansion. Yunak Evleri is an inspiring hotel – an ideal base for exploring Cappadocia’s elaborate underground cities, hidden cavernous churches and enchanting rock terrain. With its unique location in Ortahisar Village, literally meaning Middle Fortress, Tafoni Houses offers the discerning traveler convenience of being minutes away from major sites as well as proposing an ambiance of seclusion and tranquility. Having thirteen spacious suites that are hosted in ancient cave dwellings, accommodation at Tafoni Houses expresses fineness and elegance accessorized by objects d’art and art deco furniture. With its spacious outdoor terraces and lush landscaping, Tafoni Houses offers the aura of a private club where guests can enjoy socially inviting ambiances, or else, they may prefer to disappear for an intimate getaway. Whether the call is for a relaxing massage treatment in your cave or a sip of cocktail while watching the starlit skies with vintage telescopes, at Tafoni Houses you will “Unveil Il Canto di Cappadocia”. Incorporating a complex of ancient cave dwellings, this castle-like hotel is an 8-minute walk from the Zelve Open Air Museum, exhibiting an abandoned cave community, and 1.6 km from the 10th-century Al Nazar Church. Featuring walls of locally sourced stone, or carved directly out of “fairy chimney” rock formations, the luxe, medieval rooms offer free WiFi, minibars, flat-screens and tea and coffeemakers. Suites feature living areas include; some quarters add fireplaces. Free breakfast is served in the buffet restaurant, and there’s a cafe with a terrace. There are also wine and cocktail bars. The spa offers a Turkish bath, saunas and a gym.